I am honoured that 2015 will be my second year getting support from the Dave Rayner Fund. I started cycling when I was 9 years old. I was introduced to the sport by my uncle Noel. I still remember learning how to ride without stabilisers in his garden! At the time, the sport was nothing but fun. Every weekend I would travel to races all around Ireland with my friends, squeezed into into a bus with all of our bikes. It was then I really fell in love with cycling! I was a very consistent youth rider, always in the prizes and picking up a numerous wins. The highlight of my years in underage was being shortlisted for the European Youth Olympics. It was as a Junior that I realised I could be quite a decent rider if I put my mind to it. I worked hard and picked up a lot of nice results in Ireland which got me selected for the first time to ride for my country. I have been a member of the National set-up ever since. I first experienced Belgium for 7 weeks in 2011, as a 2nd year junior. I gained valuable experiences which brought me to 2012. After I finished my exams I spent 4 months of the summer living in Oudenaarde. I spent both 2011 and 2012 with ASFRA Racing Team. In 2013, my first year as a full-time cyclist, I joined the Belgian team Terra Footwear-Bicycle Line. I was pleased with my progress through 2013, so rejoined Terra for 2014 where I had a better year. I rode with the Irish National Team for the U23 Coupe de Nations both years. I learnt a lot in my few years as an amateur in Belgium and came very close to winning - the experiences I’ve gained will be invaluable for the coming years. For 2015 I am joining UCI Continental Team An Post-Chain Reaction. 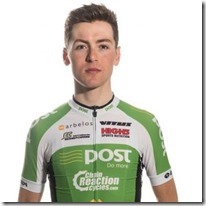 It is an Irish-registered UCI team run by Irish cycling legend Sean Kelly and Kurt Bogaerts. The race programme is awesome! It consists of mostly UCI Europe Tour races (1.1, 2.1 and 1.2 events), as well as the U23 Nations Cups with the Irish National Team. A busy year ahead, racing with some of the top pro's in the world! I have already been on the team training camps. We had one in December for a week, and another in January for 12 days - both were held in Calpe, Spain. I start racing on February 1st at GP Marseille UCI 1.1, then 2 days later at Etoille de Besseges - a 5 day UCI 2.1. An earlier start to previous years, but exciting!